Supplements are useless if you want to die! 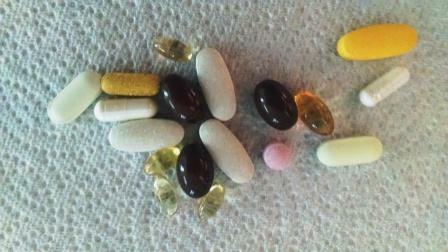 Don’t take vitamins and minerals as they are a waste of time and money. You get enough nutrients through the food that you eat. This is repeated over and over again by the powers that control our health. Food is much more important to your health than medicine and yet we spend almost 77% more on health than we do on food (1.264 trillion for food and 2.237 trillion for healthcare). When you are trying to determine the purpose and paths that are placed on us, often the statement, “follow the money,” arises. We find that we are last in the twenty wealthiest countries of the world in life expectancy and spend much more than any other country on health. If the numbers for spending on healthcare and food were reversed, then we might have a chance for a much longer life expectancy. I am often asked what I take to prevent illness. When I tell them, there is much concern about taking so many tablets. In the mind of the average American is the issue that this many ‘pills’ could have very serious side effects and might make them sick. This is what has been perpetrated on the American public. Vitamins and minerals are not good for you and like pharmaceuticals should be pharmaceuticals are not good for you like vitamins and minerals. However, vitamins and minerals do not have serious side effects like pharmaceuticals. But if it is in the form of a pharmaceutical then we make assumptions that are not correct about the side effects. Please note that I have said vitamins and minerals. When you start to take herbs then this is no different than taking a pharmaceutical. Most pharmaceuticals have some basis in herbal origins. The issue is how we process foods and change the characteristics of the nutrients. In many cases nutrients are not only changed, they are completely stripped from the food through processing. The major forms of processes that destroy food are over-heating and mechanical shear like homogenization and size reduction. A change in the characteristics of enzymes, protein, and fat affects the ability of the body to absorb the proper nutrients. We have now arrived at the point that we must take supplements in addition to the food that we eat to be healthy. Of course this says nothing about the synthetic vitamins that are put into our foods or pesticide and herbicide toxins affect on health. Here are the additional nutrients I take on a daily basis. Compliance by most in taking the additional nutrients is difficult because it is not a fast food burger or a bowel of ice cream. Also, the form looks like pharmaceuticals and we fear side effects. This entry was posted in Deficiency Disease, Nutrient Deficiency and tagged food toxins, life expectancy, nutrient deficiency, vitamins and minerals are safe by Mark Pegram. Bookmark the permalink.